The figure used for this unit is a Heroclix figure from the Marvel Hammer of Thor set. Its model number and name are #009 / Malekith. Character Bio - An ancient enemy of Asgard banished to another dimension centuries ago, Malekith was freed in the modern day by Surtur. Surtur charged Malekith with retaking his ancient weapon, the Casket of Ancient Winters, as it had the power to bring Surtur to Earth. Malekith took command of his people, the Dark Elves of Svartalfheim, and brought the full force of the Wild Hunt down on Eric and Roger Willis, human guardians of the Casket under the protection of Thor. Eric was killed, but Thor put a temporary end to Malekith's schemes by destroying the Casket. Though Malekith lost favor with the Dark Elves, he remained a menace to Thor and Asgard. He eventually retook control of his former subjects by killing Queen Alflyse, who had taken his place, and terrorizing the populace into electing him as their new leader. Q: What happens when you can't target and attack the switched figure in Illusionary Arts? A: Any time you target a figure and realize you can't attack them, you get to decide whether to try to target a different figure instead and go on with your turn as normal. As a figure with the Magical Defense special power, Malekith has these Magical Defense Synergies. As a figure with the Flying special power, Malekith interacts differently with certain special powers. Current Special Powers that Interact Differently with the Flying special power. 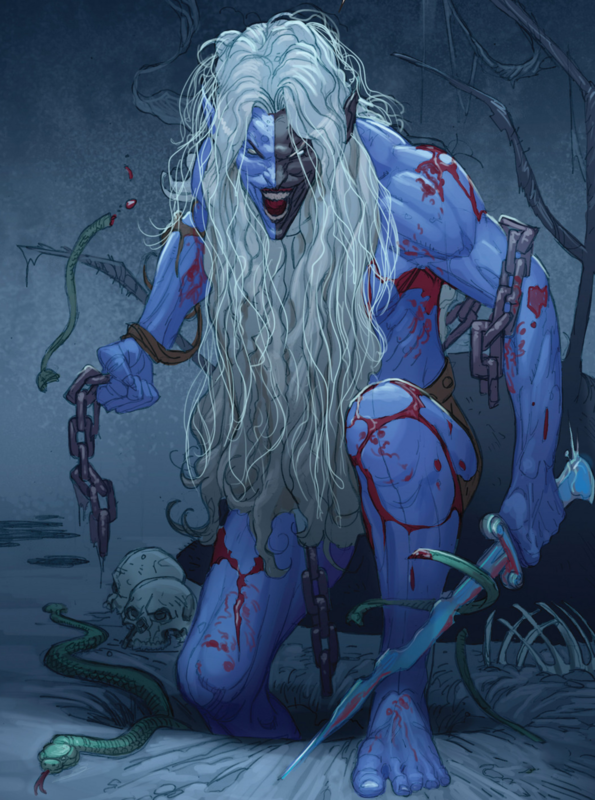 As a figure with the Super Strength special power, Malekith cannot be affected by aspects of certain special powers. Current Special Powers that Interact Differently with the Super Strength special power. As a figure with the Magical Defense special power, Malekith interacts differently with certain special powers. Special Powers that Interact Differently with the Magical Defense special power. Illusionary Arts requires an "X" Order Marker to activate, pairing him with Loki can grant him an additional "X" Order Marker with God of Mischief. Dark Faerie Deception allows Malekith to bypass certain defensive powers on his turn, that trigger based on movement or attacks from an enemy/opponent figure. Since Malekith is considered friendly to all figures that opponent controls, some specials will not affect him as long as Dark Faerie Deception is in effect. A few examples: Green Lantern's Green Power Shield, War Machine's Auto Chain Gun, Doctor Doom's Pit Trap 14, Deadpool's Wisecrack 13, Daredevil's Radar Sense 12, Cosmic Boy's Magnetic Throw Defense, Bizarro's Villainous Duty, Batman II's Shadow Strike 15, Invisible Woman's Invisibility, Darkseid's Imposing Presence, Doctor Strange's Sorcerer Supereme, any figure's Intangibility. Dark Faerie Deception prevents Malekith from taking any leaving engagement attacks from opponent's figures he is considered friendly to, and Malekith may attack figures non-adjacent even when adjacent to figures of that opponent, because he is not considered engaged while friendly. Last edited by Ronin; February 10th, 2018 at 10:34 AM. If Malekith or a friendly figure within 3 spaces of Malekith is targeted for an attack, you may reveal an "X" Order Marker on this card. Choose a figure other than the attacker within 6 clear sight spaces of Malekith and switch the targeted figure with the chosen figure. The attacking figure must then target and attack the chosen figure, if possible. Figures moved with this special power will not take any leaving engagement attacks. Before taking a turn with Malekith, if there is at least one unrevealed Order Marker on this card, you may choose an opponent. For the remainder of the turn, all figures controlled by that opponent are considered friendly to Malekith. When Malekith is attacked by an opponent's figure that does not have the Magical Defense special power, the most wounds Malekith can take for this attack is one. Last edited by Arkham; June 16th, 2015 at 05:10 PM. I ran some playtests with the original design(Illusionist Deception 15), as well as with Illusionary Arts, just to be prepared ahead of time. Does it pass, Yes or No? What should be the unit's point value? -6 wounds on Invisible Woman. -5 wounds on Mr. Fantastic. -1 wound on The Thing. -Mr. Fantastic made it difficult for Malekith, as he was adjacent each time he attacked, thus no +5 to his roll. He also wouldn't have been able to use it due to Mr. Fantastic's Rubber Wrap. However, he didn't get 15+ once, out of 5 tries. -Both teams took position on the inside area next to the ruin. Malekith, Mr. F., Darkseid, and Thing took the height, while Bane and Invisible Woman stood adjacently below. Malekith took out IW, but then Bane was taken out by Thing. Malekith took out Mr. Fantastic, then Darkseid took out Thing. Human Torch made a desperation move, getting adjacent to Malekith and Darkseid, and on the following turn he used FO4, with no wounds from LE, and then followed up with his Supernova killing off Malekith and Darkseid, and severely wounding Blob. However, Blob managed to barely finish off Human Torch first. Army 2: IW moves. Mr. F. moves. Army 2: Thing moves. Mr. F. moves. Army 2: Thing moves. HT moves. Mr. F. moves, attacks Bane, blocked. Army 1: Malekith uses his teleport, attacks Mr. F., blocked. Army 2: IW moves. Thing moves, attacks Bane, botches defense, 1 wound. HT moves, attacks Bane, blocked. Mr. F. attacks Malekith, Malekith rolls a 12, blocked, uses Teleport to get adjacent to IW. Army 1: Malekith attacks IW from height, rolls 5 skulls, 4 wounds. Army 2: Thing attacks Bane, 1 wound, again, 2 wounds. Mr. F. attacks Malekith, Malekith rolls a 7, whiffs on defense, 1 wound. Army 1: Darkseid attacks Thing, 1 wound. Army 2: Thing attacks Bane, 1 wound, again, blocked. HT attacks Bane, 2 wounds, he's dead. Mr. F. attacks Malekith, Malekith rolls an 11, blocked. Army 1: Malekith attacks IW from height, 4 skulls, 2 wounds, she's dead. Army 2: Thing attacks Darkseid, blocked. Mr. F. attacks Malekith, 4 skulls, Malekith rolls a 3, 1 wound. Army 1: Malekith attacks Mr. F., 3 skulls, blocked. Army 2: Mr. F. attacks Malekith, 3 skulls, Malekith rolls a 9, blocked. Army 1: Darkseid moves, attacks Mr. F., 1 wound. Army 2: Thing attacks Darkseid, 5 skulls, 4 wounds. Mr. F. attacks Malekith, rolls 12, whiffs defense, 1 wound. Army 1: Malekith attacks Mr. F., 3 skulls, 2 wounds. Army 2: Mr. F. attacks Darkseid, blocked. Army 1: Malekith attacks Mr. F., 3 skulls, whiffs defense, 3 wounds, he's dead. Army 1: Darkseid attacks Thing, 5 skulls, 4 wounds. Army 2: Thing attacks Darkseid, blocked. Army 1: Malekith attacks Thing, blocked. Army 2: Thing moves, attacks Darkseid, blocked. Army 1: Malekith attacks Thing, 1 wound, he's dead. Army 2: HT moves, attacks Darkseid, blocked. Army 1: Darkseid attacks HT, 5 skulls, 3 wounds. Army 2: HT uses FO4, Malekith and Darkseid both take 2 wounds, HT moves, uses Supernova SA, 5 skulls, Malekith takes 1 wound, he's dead. Darkseid takes 3 wounds, he's dead. Blob whiffs defense, 5 wounds. Army 1: Blob moves, attacks HT, blocked. Army 2: HT attacks Blob, blocked. Army 1: Blob attacks HT, 2 wounds, he's dead. -Malekith's ID was successful 2/3 times from an adjacent attacking figure. He rolled a 17, a 13, and a 15. ID led to 2 wounds on Superman, by switching himself out with Superman to defend against Gorgon's attack of 5 skulls. -Superman duked it out with Psylocke and Gamora on the inside area by the ruin, while Gorgon ended up joining the fray. Flash also made his way to the scuffle, while Malekith tried taking pot shots from a distance. Psylocke managed to block and counter attacks from Superman, until her luck ran out. Gamora did quite a bit of damage to Superman as well. Malekith was able to switch a couple times, once leading to Superman being attacked by his own teammate Gorgon, and the other sacrificing Blob to defend in order to keep Flash locked down, but Blob ended up getting quite a beating. Superman was taken out by Gamora, Gorgon was taken out, and it came down to Flash and Malekith. Malekith took a swipe at Flash, and Flash wasn't able to escape, causing his death. Army 2: Superman moves, uses SA on Gamora, blocked. Army 1: Malekith uses his teleport, attacks Superman from height, 4 skulls, blocked. Army 2: Superman moves, attacks Psylocke, blocked, Superman takes 1 wound. Army 1: Gamora moves, attacks Superman, 1 wound. Army 2: Superman attacks Psylocke, blocked, Superman takes 1 wound. Army 1: Malekith attacks Superman, blocked. Army 2: Gorgon moves, attacks Malekith, 5 skulls, Malekith rolls a 17, switches with Superman, 2 wounds. Army 1: Psylocke moves, uses PK on Gorgon, nothing happens. Army 2: Superman attacks Psylocke, blocked. Army 1: Gamora attacks Superman, blocked. Army 2: Superman attacks Psylocke, 6 skulls, 4 wounds. Army 1: Malekith attacks Gorgon with height, 4 skulls, 3 wounds. Army 2: Gorgon attacks Psylocke, 5 skulls, 2 wounds, she's dead. Army 2: Superman attacks Gamora, 5 skulls, 2 wounds. Army 1: Gamora attacks Superman, 5 skulls, blocked. Army 2: Flash moves, uses SA on Malekith, 1 wound, Malekith teleports. Attacks Gamora, 1 wound, again, blocked, again, blocked. Army 1: Malekith attacks Gorgon from height, blocked. Army 2: Gorgon moves, attacks Gamora, blocked, Gorgon takes 3 wounds, he's dead. Army 1: Gamora attacks Superman, 6 skulls, 5 wounds, he's dead. Army 1: Malekith teleports, attacks Flash, blocked. Army 1: Gamora attacks Flash, dodged. Army 2: Flash uses SA on Gamora, all blocked. Army 1: Gamora attacks Flash, 2 wounds, rolls for GS, fails. Army 1: Malekith attacks Flash, dodges. Army 2: Flash uses SA on Gamora, 2 wounds, again, 1 wound, again, 1 wound, she's dead, again on Malekith, rolls a 13, blocked. Army 2: Flash uses SA on Malekith, Malekith rolls 15, switches with Blob, 1 wound, again, whiffs defense, 1 wound, again, whiffs defense, 2 wounds, again, blocked. Army 2: Flash uses SA on Blob, whiffs defense , 2 wounds, he's dead. Army 1: Malekith teleports, attacks Flash, 4 skulls, 3 wounds, he's dead. -2 wounds on Scarlet Witch. -Malekith's ID was successful 0/2 times. -Both sides met in the middle, as well as some towards the ruin. Scarlet got a couple curses out, but missing her roll to re-roll skulls both times, led to her death early on. Zatanna tried removing the curse from Fate, but was unsuccessful, as well as unable to Mindwipe any enemies. Some whiffed defense rolls on both sides, led to a lot of deaths quick, especially when Selene came out. It came down to Malekith squaring off with Raven and Selene, and he wasn't able to succeed in an Illusionist Deception roll, nor could he wound Selene to bring her down a notch. Which led to head downfall. Army 2: Scarlet Witch moves. Army 1: Dr. Fate teleports himself and Zatanna. Army 2: Scarlet Witch moves, puts curse on Zatanna, attacks Zatanna, whiffs attack. Army 1: Zatanna rolls for State Alter on Scarlet Witch, fails, attacks Scarlet, 2 wounds. Rolls for Mindwipe on Scarlet, fails. Army 2: Scarlet puts curse on Dr. Fate, attacks Zatanna, 2 wounds. Army 1: Malekith teleports, attacks Scarlet, she misses her roll, whiffs defense, 2 wounds. Army 2: Selene moves, attacks Dr. Fate, whiffs defense, 2 wounds. Army 1: Zatanna can't use her specials, stays. Army 2: Raven moves, attacks Dr. Fate, 4 skulls, 1 wound. Army 1: Zatanna moves, rolls for SA on Dr. Fate, fails, attacks Raven, 2 wounds. Rolls for MW on Raven, fails. Army 2: Selene attacks Zatanna, 5 skulls, whiffs defense, 5 wounds, she's dead. Army 1: Malekith teleports, attacks Raven from height, 4 skulls, 2 wounds. Army 2: Raven places a wound on Dr. Fate. Army 1: Malekith attacks Raven from height, 1 wound. Army 2: Selene moves, attacks Dr. Fate, 1 wound, he's dead. Army 2: Selene moves adjacent to Malekith, attacks Malekith, 4 skulls, Malekith rolls a 10, 2 wounds. Army 1: Malekith attacks Selene, blocked. Army 2: Raven places a wound on Malekith. Army 1: Malekith teleports, attacks Selene, blocked. Army 2: Selene moves adjacent to Malekith, attacks Malekith, 5 skulls, Malekith rolls a 4, 3 wounds, he's dead. Selene has 0 wounds. Raven has 3 wounds. -Malekith's ID was successful 3/5 times, 2 of which were from an adjacent attacking figure. He rolled a 2, 20, 18, 16, and a 6. ID led to 2 wounds on Sage and 2 on Oracle. -Both teams stuck to the road on the outskirts of the map. Malekith went for height, as did Dr. Fate and Bane. However, Magneto threw them all from height. Magneto was eventually killed off, as was Dr. Fate. Quasar and Bane were next to go. Leaving just Malekith and Psylocke to trade blows, while Malekith used Sage and Oracle to take some wounds for him using Illusionist Deception. This bought some time for Malekith to finish Psylocke off, but not before Sage was killed off. Malekith and Destiny traded off an attack or 2, but Malekith easily got the upper hand, and killed her ending the game. Army 2: Magneto moves, attacks Malekith, 4 skulls, Malekith rolls a 2, 1 wound, Malekith rolls 1 blank, teleports. Army 1: Doctor Fate teleports. Army 2: Quasar moves, attacks Dr. Fate, 5 skulls, 1 wound. Army 2: Magneto moves, uses MA, Dr. F. takes 1 wound, uses MA again, Malekith takes 1 wound. Army 1: Malekith teleports, attacks Magneto, blocked. Army 2: Quasar moves, attacks Dr. F., 5 skulls, 1 wound. Army 1: Dr. F. moves, attacks Quasar, Oracle reveals X, 2 wounds. Army 2: Psylocke moves, uses PK on Dr. F., 1 wound. Army 2: Magneto uses MA, Dr. Fate receives 1 wound, he's dead. Uses MA again, Bane takes 1 wound. Army 1: Malekith attacks Magneto, 4 skulls, blocked. Army 2: Quasar attacks Bane, whiffs. Army 1: Malekith attacks Magneto, Oracle reveals her X, 4 skulls, 3 wounds. Army 2: Psylocke uses PK on Bane, 1 wound. Army 1: Bane rolls for VI, attacks Magneto, Oracle reveals her X, 1 wound, Bane breaks his back, he's dead. Army 1: Malekith attacks Quasar, blocked. Army 2: Quasar attacks Bane, 3 wounds. Army 1: Bane uses VI, attacks Quasar, 6 skulls, 5 wounds, she's dead. Army 2: Psylocke uses PK on Bane, fails. Army 1: Bane rolls for VI, attacks Psylocke, blocked, Bane takes 1 wound. Army 1: Malekith teleports, attacks Psylocke, Oracle reveals her X, 4 skulls, 2 wounds. Army 2: Psylocke attacks Malekith, 4 skulls, Malekith rolls a 20, switches with Sage, 2 wounds. Army 1: Malekith teleports, attacks Psylocke, blocked, Malekith takes 1 wound. Army 2: Psylocke attacks Sage, 1 wound. Army 2: Psylocke attacks Sage, 1 wound, she'd dead. Army 1: Malekith teleports, attacks Psylocke, Oracle reveals her X, blocked. Army 2: Psylocke moves, attacks Malekith, Malekith rolls an 18, switches with Oracle, 1 wound. Army 1: Malekith teleports, attacks Psylocke from height, she whiffs defense, 2 wounds. Army 2: Psylocke moves, attacks Oracle, 1 wound. Army 1: Malekith teleports, attacks Psylocke from height, 4 skulls, 3 wounds, she'd dead. Army 1: Malekith moves, attacks Destiny, 4 skulls, 3 wounds. Army 2: Destiny moves, attacks Malekith, Malekith rolls a 6, whiffs his defense, 1 wound. Army 1: Malekith attacks Destiny, 2 wounds. Army 2: Destiny attacks Malekith, Malekith rolls a 16, swaps with Oracle, 1 wound. Army 1: Malekith moves, attacks Destiny, Oracle reveals her X, 5 skulls, 4 wounds, she's dead. Malekith has 4 wounds. Oracle has 3 wounds. -Malekith's ID was successful 0/3 times, all of which were from an adjacent figure. He rolled a 10, 10, and a 7. -Both teams met in the middle of the map, surrounding the water towards Star-Lord's team's base. Malekith took a shot at Star-Lord gaining a wound, but Wonder Woman came out and lasso'd Flash, with height, Bane, and Star-Lord adding to attack, and Flash whiffed his defense and died. From then, Gamora stepped in and killed Wonder Woman, and then Psylocke and Gamor agot into it, leading to Psylocke's death. Malekith fell to Bane, via broken back, and Star-Lord fell to Gamora, and then Bane took out Gamora. Bane and Blob were the final 2, but Blob trapped Bane giving himself height, thus the sleight advantage. It was close, but Blob got the edge. Army 1: Malekith teleports, attacks Star-Lord, blocked. Army 2: WW moves, lassos Flash, attacks, 4 skulls, he whiffs defense, he's dead. Army 1: Gamora moves, attacks WW, 2 wounds. Army 1: Malekith moves, attacks Star-Lord from height, 1 wound. Army 2: Psylocke moves, uses PK on Malekith, 1 wound. Army 2: WW attacks Gamora, 2 wounds. Army 1: Gamora attacks WW, 5 skulls, 3 wounds. Army 2: WW attacks Gamora, blocked, WW receives 1 wound, she's dead. Army 1: Gamora moves, attacks Psylocke, blocked. Army 2: Psylocke attacks Gamora, 1 wound. Army 2: Bane moves, uses VI, attacks Malekith, 5 skulls, Malekith rolls a 10, 1 wound. Army 1: Malekith teleports, attacks Bane from height, blocked. Army 2: Psylocke moves, attacks Gamora, 1 wound. Army 1: Gamora moves, attacks Psylocke, 3 wounds, fails her roll on GS. Army 2: Psylocke uses PK on Gamora, nothing happens. Army 1: Gamora attacks Psylocke, 5 skulls, whiffs her defense, 4 wounds, she's dead. Army 1: Gamora moves, attacks Star-Lord, 1 wound. Army 2: Bane moves, uses VI, attacks Malekith, Malekith rolls a 10, whiffs his defense roll, 1 wound. Army 1: Gamora attacks Star-Lord, blocked. Army 2: Bane uses VI, attacks Malekith, Malekith rolls a 7, 1 wound, Bane uses Back Breaker to kill Malekith. Army 1: Gamora attacks S-L, 1 wound. Army 1: Gamora attacks S-L, 5 skulls, 3 wounds, he's dead. Army 2: Bane moves, uses VI, attacks Gamora, rolls a 20, blocked. Army 1: Gamora attacks Bane, 2 wounds. Army 2: Bane uses VI, attacks Gamora, 5 skulls, 2 wounds. Army 2: Bane uses VI, attacks Gamora, 4 skulls, 2 wounds, she's dead. Army 1: Blob moves, attacks Bane, 2 wounds. Army 2: Bane uses VI, attacks Blob, 2 wounds. Army 1: Blob moves, attacks Bane from height, blocked. Army 2: Bane uses VI, attacks Blob, blocked. Army 1: Blob attacks Bane, blocked. Army 2: Bane uses VI, attacks Blob, 1 wound. Army 2: Bane uses VI, attacks Blob, rolls 19, blocked. Army 1: Blob attacks Bane, 1 wound. Army 1: Blob attacks Bane, 4 skulls, 1 wound, he's dead. -Malekith's ID was successful 2/6 times, all of which were from an adjacent figure. He rolled a 4, 15, 7, 3, 10 and a 15. His successful switches led to 5 wounds on Oracle. -This was a tough battle for Malekith's team. With such heavy hitters, Darkseid had to do what he could to keep Superman and Thor at bay. It ended up being successful, because Darkseid killed Superman, and did a few wounds on Thor. Unfortunately for him, Darkseid whiffed a defense, which led to his death. Gamora was also killed off by Thor beforehand, leaving just Malekith vs. Thor and Oracle. Malekith did what he could to try and take Oracle out of the equation, thus taking out her support, but ultimately it took Malekith deceiving Thor with an illusion to get him to kill her for him. Malekith managed to put 1 wound on Thor, before ultimately meeting his own demise. Army 2: Superman moves, uses SA on Darkseid, whiffs. Army 1: Malekith teleports, attacks Superman, blocked. Army 2: Superman attacks Malekith, 5 skulls, Malekith rolls a 4, 1 wound. Army 1: Gamora moves, attacks Superman, 5 skulls, 2 wounds, Gamora rolls 15 for her GS, Superman takes 2 more wounds. Army 2: Superman attacks Gamora, blocked. Army 1: Darkseid moves, attacks Superman, 5 skulls, 2 wounds. Army 2: Superman attacks Darkseid, blocked. Army 2: Thor moves, attacks Gamora, Oracle reveals her X, 3 wounds. Army 2: Superman attacks Darkseid, 1 wound. Army 1: Darkseid attacks Superman, 1 wound. Army 2: Thor attacks Gamora, 1 wound. Army 1: Darkseid attacks Superman, 2 wounds, he's dead. Army 2: Thor moves, attacks Gamora, Oracle reveals her X, 7 skulls, 4 wounds, she's dead. Army 1: Darkseid attacks Thor,	blocked. Army 2: Thor uses GOT, fails. Army 1: Darkseid attacks Thor, blocked. Army 2: Thor attacks Darkseid, blocked. Army 2: Thor attacks Darkseid, Oracle reveals her X, blocked. Army 1: Darkseid attacks Thor, 5 skulls, 3 wounds. Army 2: Thor attacks Darkseid, Oracle reveals her X, 5 skulls, 2 wounds. Army 2: Thor attacks Darkseid, 1 wound. Army 2: Thor attacks Darkseid, 5 skulls, whiffs defense, 5 wounds, he's dead. Army 2: Thor attacks Malekith, blocked, Malekith teleports. Army 1: Malekith attacks Oracle from height, blocked. Army 2: Thor moves, uses SA on Malekith, Malekith rolls 15, switches with Oracle, blocked. Army 1: Malekith moves, attacks Oracle, 1 wound. Army 2: Thor moves, attacks Malekith, Oracle reveals her X, Malekith rolls a 7, 1 wound. Army 1: Malekith teleports, attacks Thor from height, blocked. Army 1: Malekith attacks Thor from height, blocked. Army 2: Thor moves, attacks Malekith, Oracle reveals her X, Malekith rolls a 3, 1 wound. Army 1: Malekith teleports, attacks Oracle, whiffs. Army 2: Thor moves, attacks Malekith, 7 skulls, Malekith rolls a 10, 1 wound. Army 2: Thor attacks Malekith, Oracle reveals her X, 6 skulls, Malekith rolls a 15, switches with Oracle, 5 wounds, she's dead. Army 1: Malekith teleports, attacks Thor from height, 1 wound. Army 2: Thor moves, attacks Malekith, whiffs defense, 1 wound, he's dead. Damage caused/avoided: 2 wounds on Cap. Psylocke with 4 wounds. Flash with 3 wounds. -2 wounds on Invisible Woman. 2 wounds on Bane. 2 wounds on Invisible Woman. -3 wound on Green Arrow. Green Arrow with 3 wounds. Malekith with 2 wounds. Gamora with 3 wounds. -Loki placed both X OM on Malekith for the first 3 rounds. -Cable was cut off before he could get to height, and only got in 1 turn. -Loki hit his GoE putting 3 wounds back on Wolverine. -Sage was trapped between Malekith, Cable, and a tree. -Wolverine was killed before he could do any damage. -Loki put 2 wounds on Psylocke with GoE. -Gamora landed 6 skulls on Psylocke. Loki with 6 wounds. Malekith with 0 wounds. Gamora with 0 wounds. -Mr. Fantastic got killed in the first turn in the 2nd round, causing their team to lose all their turns. -Invisible Woman botched her defense and was killed in 1 attack. -Thing botched his defense and took 5 wounds to end the game. -1 wound on Human Torch. Loki with 3 wounds. Malekith with 3 wounds. -A few whiffed defense rolls for the Fantastic Four. -Loki hit GoE to put 3 wounds on Thing. Mr. Fantastic with 4 wounds. Invisible Woman with 3 wounds. -Mr. Fantastic has decent FL4 rolls. -Malekith was targeted and attacked by each attack for the first 2 rounds, so his 2 X OM couldn't keep up. -Loki hit GoE and put 4 wounds on Thing. -2 wounds on Mr. Fantastic. -IW whiffed her defense, took 3 wounds. -Human Torch used SNSA to put 3 wounds on Loki, the final wound on Gamora, Malekith, and 1 on Mr. Fantastic. -Loki hit GoE and put 2 wounds on Thing. -Thing hit RWD4 and put 1 wound on Loki. Mr. Fantastic with 4 wounds. Thing with 4 wounds. -Malekith was ganged up on from the start, and took 4 wounds total from HT's FO4. -Loki hit GoE to put 4 wounds on Thing. -Thing used Clobberin' Time and killed Gamora in 2 attacks. Loki with 6 wounds. Gamora with 1 wound. Malekith with 3 wounds. -Human Torch whiffed his defense, took 2 wounds. -Gamora got 6 skulls, 3 wounds on Mr. F., killing him. -Loki successfully hits GoE to put 4 wounds on Thing. -1 wound on Invisible Woman. Thing with 0 wounds. Mr. Fantastic with 4 wounds. Human Torch with 4 wounds. -Loki was taken out earlier than usual, thus eliminating the 2nd X. -Malekith was the last alive on his team this game. Gorgon with 4 wounds. Desrtiny with 0 wounds. -Malekith rolled 5 skulls on Magneto, he rolled 1 shield. -Magneto threw Malekith twice, 2 wounds. -Loki rolled 6 skulls on Magneto. -Psylocke rolled a 14 on Malekith 1 wound. -Psylocke rolled a 23 on Malekith, killing him. -Gamora rolled 5 skulls on Psylocke. -Gorgon scored 5 wounds on Loki using his GKSA. -Gamora rolled 5 skulls on Gorgon, only 1 wound. -Gorgon got PS12 on Gamora twice. -Magneto keeps using MA on Malekith, and once on Loki. -Loki deals 4 wounds to Magneto. -Magneto kills Malekith with MA. -Loki rolls 6 skulls against Magneto, kills him. -Gorgon and Gamora duked it out for the final 1-on-1, coming down to 1 wound each. Last edited by Arkham; February 17th, 2015 at 12:10 AM. An ancient enemy of Asgard banished to another dimension centuries ago, Malekith was freed in the modern day by Surtur. Surtur charged Malekith with retaking his ancient weapon, the Casket of Ancient Winters, as it had the power to bring Surtur to Earth. Suggestion for an edited-down, rewritten bio, because sometimes Comic Vine makes me cry. ("Malekith had his human agents harass Eric, in an attempt to regain the Casket, this evetually lead to his being murdered by Malekith himself." Blech!) Feel free to use anything you like and tweak/ignore what you don't. Good to see this up and running, though! You know, it didn't occur to me until just now that we'd be getting back-to-back ( ) Thor-themed Public Designs. Too bad there's no-one currently in the running to go for the threepeat. Jumping the gun a little, aren't we? Beta Ray Bill still hasn't passed the final vote yet, though he's now only one vote away. Second, when you start a design, you need to PM all the Heroes to let them know the thread is up. You also need to make a post in the C3G Promotions and Welcome to C3G threads. Third, please update the SP with the design that was voted on. You are free to post changes you would like to make, but the thread needs to start with the original design. I personally like the changes, and we'll discuss them as part of the design phase, but designs should not be changed in between voting and posting the thread. I took that as "we voted to pass it, except that one wording change, as soon as that's done, it's released". Clearly a mistake on my part(as usual). 2. That's why I haven't done so, as soon as I started to second guess and realized there was more to go, I held off on anything else. You might want to start copy and pasting or at least linking all the discussion in the public thread that took place on the design between when voting began and now. It seems as though the design has already gone through quite a bit of redesign and not everyone might be up to date on things. I don't really like the "I cancel you, no, I cancel YOU" interaction between Dark Farie Teleport and the various cyberclaw-ish powers. Ah, I see. Honest mistake, it can be confusing when a vote is and isn't required. BRB is close now, so we'll just leave this for now and you can send out notice when he officially passes. Glad to see this one finally get started! The current version looks solid, though I'd want to bring his stats down a bit. I don't think Malekith should be that much of an offensive threat. He's not much of a fighter in the comics. I know there was some pre-design discussion in the Public Design Post though. Do you want to post the alternate idea for Illusionist Deception, @Aggressive Sock , or do you prefer this version? Instead of moving normally with Malekith, or if at least one blank was rolled when he defended against an opponent's attack, after placing any wounds received, you may place him on any empty space within 8 spaces. No special on any Army Card may prevent Malekith from using Dark Faerie Teleport. I don't like this line. It's just too messy with Blob, Mister Fantastic as well as others where it's not clear what "prevent" means. Plus, no other teleport power gets around Stuck, even though they probably should, thematically. 1 attack of 4 at a range of 4 isn't much of an offensive threat, at all - not at his price range. Drop it any more, and he moves from 'not much of an offensive threat' to 'wow, he's utterly pathetic' territory - from what AG's said, that doesn't sound thematic. I much prefer the alternative Deception Power based on the X OM.